The Cheviot Hills cover more than 400 sq. 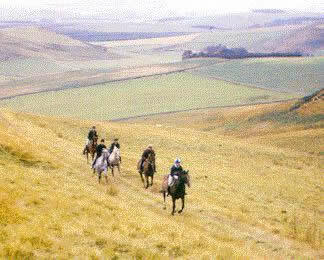 miles of Scotland's borderland with England and provide some of the finest riding country in Britain. The scenery is breathtaking, and access in parts of this sparsely populated area is only possible on foot or horseback. Rich in history of the Romans and the region's turbulent past, your imagination abounds as you ride along the grassy tracks of Dere Street (the Roman road) tracing the steps of those ancient conquerors - followed later in history by the border Reivers, whose cattle and sheep stealing exploits in the borderlands remain infamous. My Horses are well mannered but forward going, offering the capable adult rider a fun ride. They range in height from 14 hh to 16.2 hh..
Because the horses are well schooled and keen they are not suitable for riders with only pony trekking experience to hack out on. Private lessons are available for riders who would like to improve their riding to enable them to hack out. We ride in small groups with pace dictated by the terrain. The riding is along quiet country lanes, through woodland and across farmland. There are usually plenty of opportunities for long canters but this does depend on the going. In spring, when there are lambs and calves around, care has to be taken not to disturb them and their mothers! I specialise in short breaks and am quite happy to 'mix and match'. If a rider would like lessons as well as hacks out this can be arranged. Or if a rider did not feel they could manage a full day ride every day then a half day ride could be taken. Safety is an all important factor, and we therefore expect riders to wear correct riding boots and riding hats (to BSEN1384 or PAS015 safety specification.). Body protectors are recommended. Ferniehirst Mill Lodge was built in 1980 in the secluded valley of the Jed Water. The 8 bedrooms are all en-suite with either bathroom or shower room and an abundance of hot water is always available to refresh the tired rider. There is a spacious lounge, with TV that overlooks the river, for riders to relax in. Wi-Fi is available. Accomodation at the Lodge is also available to non riders.